Joel Ross debuts a thrilling adventure series in which living in the sky is the new reality and a few determined slum kids just might become heroes. This Texas Bluebonnet selection—a fantasy filled with daring and hope and a wonderfully imaginative world—is perfect for fans of Rick Riordan and Brandon Mull. Once the Fog started rising, the earth was covered with a deadly white mist until nothing remained but the mountaintops. Now humanity clings to its highest peaks, called the Rooftop, where the wealthy Five Families rule over the lower slopes and floating junkyards. Thirteen-year-old Chess and his friends Hazel, Bea, and Swedish sail their rickety air raft over the deadly Fog, scavenging the ruins for anything they can sell to survive. But now survival isn't enough. They must risk everything to get to the miraculous city of Port Oro, the only place where their beloved Mrs. E can be cured of fogsickness. Yet the ruthless Lord Kodoc is hot on their trail, for Chess has a precious secret, one that Kodoc is desperate to use against him. Now Chess will face any danger to protect his friends, even if it means confronting what he fears the most. 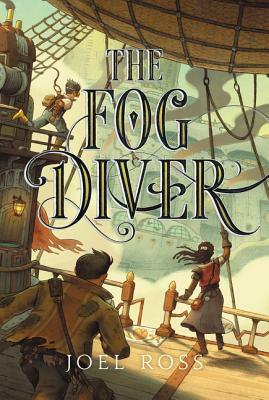 Joel Ross is the author of The Fog Diver, which received the Cybils Award and the YouPer Award from the Michigan Library Association and was named to the Texas Bluebonnet Award Master List. He is also the author of The Lost Compass as well as two World War II thrillers for adults (Double Cross Blind and White Flag Down). He lives in Santa Barbara, California, with his wife, Lee Nichols, who is also a full-time writer, and their son, Ben, who is a full-time kid. To find out more information, go to www.fogdiver.com.